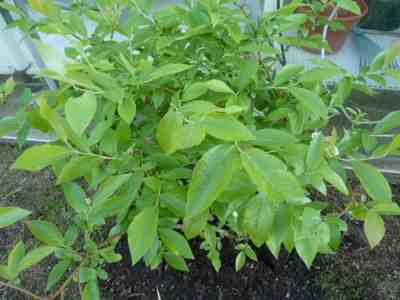 My Home and Garden: I still have lots of lemons and the blueberry walk is progressing nicely. I still have lots of lemons and the blueberry walk is progressing nicely. 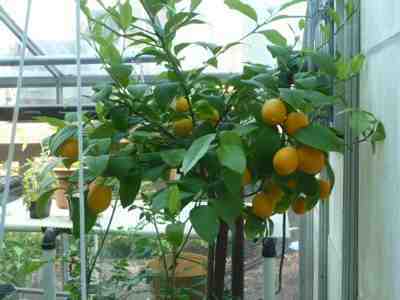 The Meyer Lemon from behind the greenhouse. You can see how many lemons I still have. I am going to juice them and put it into ice cube trays, so I have nice fresh, local organic lemon juice to use in recipes. This is the newest member of the blueberry walk. I bought two more large bushes this week and I will put in two smaller bushes between them. Stay tuned. Wow, that Lemon tree has certainly been a good investment! We love Meyer lemons at our house. The juice can be replaced as the acid in a salad dressing (instead of vinegar), with fresh herbs and a light oil...zest of the lemon on top of the plate..oh now I am getting hungry )))). Lucky you having your own tree!! Wow! I can't believe how many lemons on that smallish tree! Lucky you! It was a great investment. So much so that I went back and bought a Lime tree a few weeks ago. I'm going to pick the lemons and juice them this weekend. Then freeze them in ice cube trays to freeze. They are so juicy and delicious. We actually had one tonight squeezed over some ahi that we were lightly cooking for our salads. Wow your tree looks awesome! I'm also in Sidney and am looking for a Meyer Lemon, where did you find yours? I was thinking of seeing Bob Duncan for one .. I did get my Meyer lemon from Bob Duncan at Fruit Trees and More on Wain Road. It is amazing. It has grown really fast and I got a ton of lemons. My sister gave me money for Christmas to buy a fruit tree. I added a Bearss Lime. The amount of lemons you're getting is great! They are absolutely FULL of juice. Unlike anything you buy. Yumm.